It goes through the counties of Herefordshire, Gloucestershire and Worcestershire, and is roughly located between the three county towns. It meets the M5 at junction 8. 1960, with the bit between J1 and the M5 following in 1962. It was built ridiculously early on in the motorway building programme. To give you some idea, it was really the second full-length motorway to be built (as opposed to a by-pass that later became part of bigger things). Even today it barely has enough traffic to justify its existence. So why was it built then? OK, the first theory involves a traffic survey that went horribly, spectacularly wrong. So overestimated was this survey, in fact, that the need for this motorway was seen as a matter of some urgency, and so construction was pushed ahead. The second theory has a little more political intrigue about it. It would appear that the Labour government of the early planning stage was extremely interested in the possibility of linking South Wales, and its steelworks and coalfields, with the engineering heartlands of Birmingham, Wolverhampton and the Black Country, for extremely obvious political gain. When this government was succeeded by a Conservative one, and financial constraints were still very tight, then the M50 was seen as a cheap way of doing things. Different sources claim one or the other story as being the real reason, and no-one seems to be quite sure! Well, this is another example of an early motorway that's been pretty much untouched, save for the addition of modern signage and a central barrier. It's not quite as good as the M45 for that, but it is pretty good! Of course! Thanks go to Tom Sutch of Apex Corner, who has kindly provided the Photo Gallery. I just read your two theories for the existence of M50, but my reasoning is a little different to either of those. I think that a motorway network for Britain had been sketched out in the 1950s and that M50 was always there as a Midlands to South Wales link (probably extending down to Newport - or at least Monmouth). When it came to doling out the resources to actually construct some of it, M50 was one of the very few that had passed planning permission and preliminary design, and therefore it was started immediately (along with Doncaster bypass and a few others). This idea makes sense when you consider that it crosses open, rural countryside, with no requirement to even approach any urban area (unlike the motorways to the Midlands, which had to end somewhere sensible to meet up via the Midlands Link motorways in 1972). It is perhaps telling that the M5 connection was a later contract; that suggests to me that the details of M5 were still uncertain when M50 construction began. So, a bit less political intrigue than your Theory 2, but plausible, I think. I think both your theories as to why it was built are a bit wide of the mark. Allow me to suggest one that is tethered to reality. When the motorway network was being pencilled in by Westminster boffins, they drew a motorway south from Birmingham to Bristol. They also wanted traffic to use that road to reach South Wales - connecting up industry as you suggest. Imagine what would happen if the M5 had been built first: we wouldn't be asking questions about it now, but back in 1962, traffic trying to get to the A449 to Newport would have travelled through Gloucester, making a lengthy detour along the A40, or ended up pestering the fine folk of Tewkesbury. Obviously the Ministry's preferred route already existed in the form of the A40 and A449 beyond Ross. But to get traffic as far as Ross, a new road was needed. Therefore, the M50 was built first, not because it was seen as more important, but so that when the M5 opened, attracting lots of traffic and encouraging journeys south from the West Midlands, the route to South Wales was already open. Think of it as a very clever bit of pre-emptive planning! The M50 was very convenient to get from Liverpool to Ruadean via the M53/M56/M6/M5/M50! I would think that it is a shorter version of what it was originally intended to do. 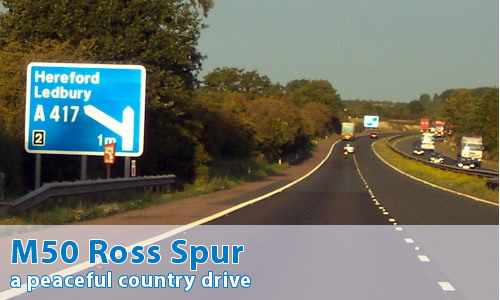 At Ross, it goes directly onto the A40 that goes to Monmouth and Brecon to the north of the Welsh Valleys. It was also good for accessing the Malvern Hills as well! I found that it was a delight to use and was a lot better than the A49 that took an age. However, I didn't like those sharp junctions that were just conventional T-Junctions that don't really comply with Motorway regs! But they weren't lit for a start and they didn't have those markings that slow you down, you know the ones - they are yellow or red. I can see why it ends with Roundabouts, as it says there isn't a lot of traffic, so why build a large cloverleaf junction? It is also a roundabout because of the M5 services coming onto it as well! So I think that parts of it are good and parts of it are bad but there is one very good thing about it. It is mainly tree lined with fantastic scenery at the Ross end! Could I add a second thought about this nice pathetic motorway? Great Britain is the homeland of the heritage railways. Unfortunately, we have no heritage motorways, to display to our children how it began with our motorways. Due to its lack of importance, the M50 is IMHO a good candidate for a heritage motorway. Completely with pre-Worboys signs, wonky-motorway signs, no asphalt but "white" beton, etc. Well I have now travelled the entire length of the M50 (westbound) and can offer the following comments. It's just like driving on a dualled A road - the southern section of the A34 sprang immediately to mind. Only because it's always been a motorway there are no buildings or frontages anywhere along it and consequently it's rather boring running through one field after another between junctions. It's virtually empty. I passed no more than about ten HGVs on the entire route. Compare that to the M5 where I could pass the same number in a few minutes. The hard shoulder varies between narrow, poor quality and nonexistent, and is absent for every single bridge. The sliproad coming off the M5 southbound to the M50 roundabout is unusually long. Wonder why this is? The cutting just before junction 4 is quite impressive. The main road past junction 4 is signed "A40" without brackets. (The A40 joins at the next roundabout along). Crash barriers were added to the M50 after a very unfortunate and tragic accident that occurred between junctions 2 and 3. In those days crash barriers only appeared in short sections on this motorway around the central piers of some of the bridges. One day in 1978, a jack-knifed lorry happened to crash end on a section of crash barrier around a bridge pier between junctions 2 and 3, the lorry rode up the crash barrier and straight into the pier of the bridge. The impact of the crash not only caused the tragic fatality of the lorry driver, but resulted in the collapse of the road deck above the motorway. As has been documented in a number of different sources, the M50 was built as an experimental motorway and the bridge that was destroyed had been the first of its type to have been built on the British motorway network. As a result all bridges of the same design had to be checked over to ensure that the same mode of failure could not happen again. Crash barriers were extended on other bridges deemed vulnerable, resulting in standard motorway practice of having crash barriers in the central reservation of nearly all of the motorway network. A milk lorry was travelling on the bridge over the motorway as the bridge collapsed. Amazingly both the driver and lorry escaped with little damaged, although the lorry was stranded as a result of the collapsed road deck, it was successfully recovered. When the bridge was rebuilt and reopened about 12 months later, the lorry and driver were the first to cross as part of the reopening ceremony. The new section of bridge can be clearly seen from the motorway, as part of the original bridge remains, resulting in two different shades in the concrete due to the difference in age. I remember many years ago that my parents had a 1963 AA Road Atlas, that had a "Plan of the Motorways" in it. Most of the M1, M4, M5 and M6 are at least projected at this point. It also included the completed M50 with an extra projected section along what is now the A40 and A465 as far as Hirwaun. This is repeated in the main map with a project motorway running from Abergavenny to Hirwaun on what was to become the A465 Heads Of The Valleys Road, built a few years later. Unfortunately it's long since been thrown out otherwise I'd find it and scan it but it does beg the question of whether the M50 was supposed to go all the way to Swansea? I may as well add my tuppence worth. Comments have been made regarding the handbrake turns on leaving Junction 3 have any of your other correspondents used J2 (the A417)? Don't - the design in terms of length of off/on slip is far better - BUT - leaving the westbound off-slip to access Ledbury as I have done many times, it's a straight run to a T-junction with the A417 and no count down/rumble strip markings on the carriageway either. If that's bad enough then arriving at the T-junction you find yourself on the inside of a bend. At one time visibility was down to about 20m due to vegetation but this had been cut back recently so its up to about 70m - for a de-restricted (60mph) road (nah - I'm not going to get technical here suffice to say it's poor). The off-slip eastbound terminates a T-junction too but that's preceded by a sharp bend (not as sharp as J3) but sharp enough to catch you out. Visibility at this T-junction isn't quite so bad as it lies on the outside of a bend with the A417 - if the vehicles going to the mobile tea-bar in the adjoining lay-by don't get in the way! Having travelled from the North East to South Wales and back fortnightly during 4 months in 2004, I personally found the M50 to be very helpful - especially when heading south on Friday afternoons as it saved the horrific task of taking the M5/M4 junction West towards Wales. Although M5/M50/A40/A449/M4 is slightly further than simply taking the M5/M4, it is a lot quieter and saves the extortionate fares on the Severn crossing going into Wales. Then I just join the M4 queues East of Newport anyway! I was living in London when the M50 opened. It didn't seem to really link anything with anything, but that was true of other motorways then. After all, the M1 ended in a field near Crick. Geoff Hanlan rebuts that theory! Nick Booth's theory I think is a little wide of the mark, literally and metaphorically. If my memory serves me right I think some of the line orders for the M4 in the vicinity of the first severn bridge were made as long ago as 1948! Not only that but the downs route of the M4 was decided on by 1957 and planning for the first Severn Bridge would have been underway by 1957 as workers houses were being built near Chepstow by 1959. I'm quite convinced the M50 doesn't really exist. Or at very least it shouldn't. It's not a real motorway, there's standard A-road signs on the carriageway rather than blue motorway ones, "Road liable to flooding" and the silly yellow "narrow lanes" ones in particular. I managed to completely miss the M50 while aiming myself from South Wales to the northbound M5, and accidentally found myself in Hereford, which has considerably wider roads and more traffic. I've been using the M50 as a passenger and driver for nearly 40 years. While you call it a pathetic motorway, I call it possibly the best motorway in the country. a) It cuts out the Severn Bridge, making it the hypotenuse of a triangle M50/M4/M5 and avoids paying tolls to French companies. b) It is a direct route to the Midland and northern motorways for the southern Marchers and South Wales. c) it is extended into South Wales along some of the prettiest primary routes available - A40/A449. It should have been a motorway all the way from the M5 to the M4 but that would have ruined Symonds Yat and other places. Yes it was a rural idyll many years ago but it became a torrent on a Friday evening as I would drive home from North Bucks. Using the M50 this year I noted how much busier it has become, but it is still as pleasant a drive as the M6 is north of the Blackpool spur. Much nicer than sitting in the NCP linear car parks which now straddle the countryside from London to Bristol, and Birmingham to Manchester. The much-criticised Junction 3 was accessed via cattle grids for many years but it was originally well used: its first 6 years were before the Severn bridge and it therefore was part of THE route to south Wales. Only a couple of years ago, I drove the length of the M50 and saw only 2 vehicles, both going the other way, East. Not a pathetic Motorway, more of a great road. My favourite motorway! I use it frequently travelling between family in S Wales and work in the Midlands. Scenic, empty and quaint, it is a pleasure to drive on, in comparison to other motorways I use often - M1, M4, M5, M42 and the dreaded M6. Surely this is what the motorway system was supposed to be like when it was first conceived.